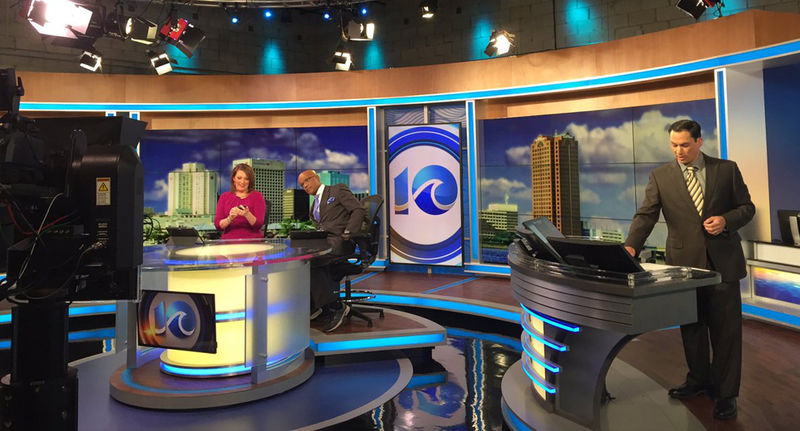 WAVY-TV, the Media General owned NBC affiliate in Hampton Roads, Va., has debuted a new set from Z Space Creative that features heavy inspiration from the circular zero in the station’s logo as well as its wave iconography. 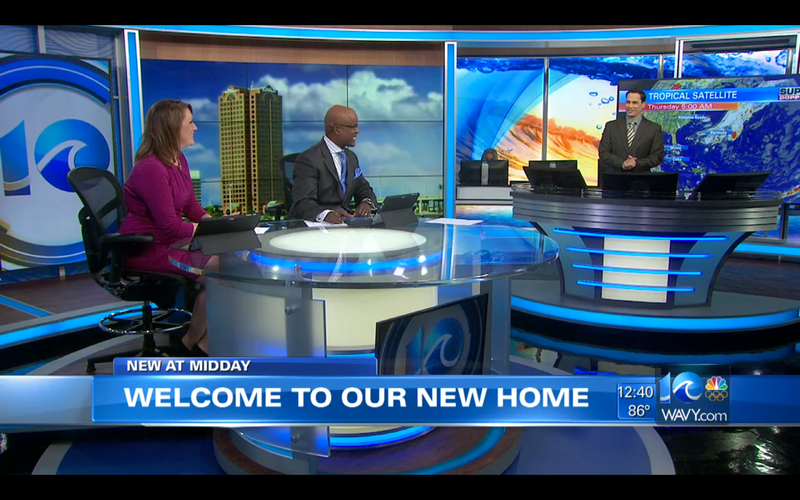 At center is a circular anchor desk that’s internally lit with structural metal elements curved translucent panels, giving it a lighter and airier feel that a typical anchor desk. Anchors sit with a vertically mounted flat panel mounted between them, allowing for prominent branding and topical graphics. Two 3×3 video walls, one on each side, show up in the two-shot anchor shot as well as the primary backgrounds on the anchor one shots. 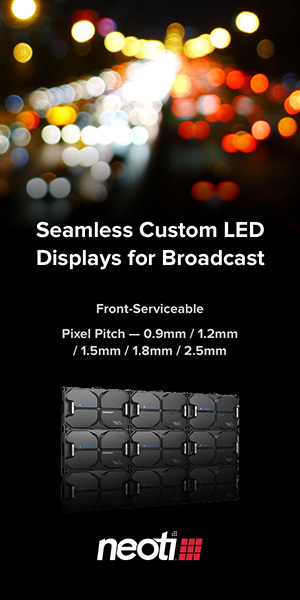 AV Design Services provided the AV installation and integration on the project. 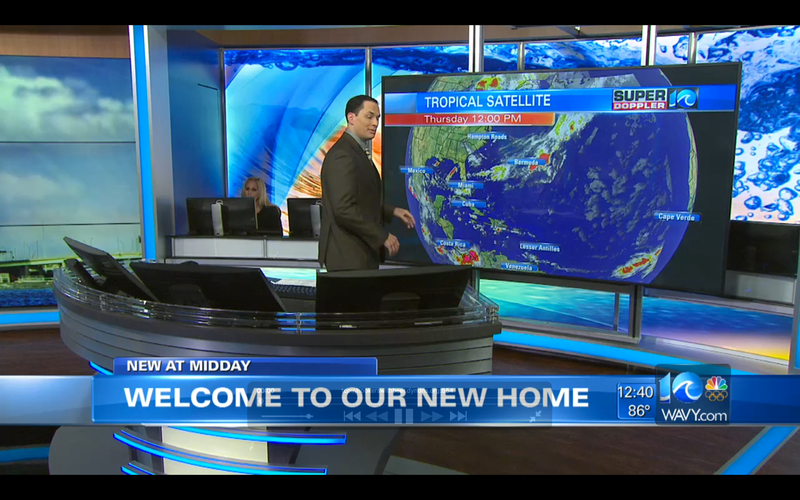 Nearby is a weather center backed with a printed graphic featuring an oversized image of a wave and a an additional large flat screen at the presentation pod, which continues with the curved theme. This part of the set also includes additional workstations. On the other side of the set is an additional 3×3 monitor array and vertical screen for stand ups and sports. Throughout the set, internally lit columns and bands in bright blue along with a simple and clean lighter wood tone continue the light and airy feel of the design.